This Sunday (September 27th) between 12:30 and 1:30 Monroe Ave (map). will be shut down between Fulton and Michigan so that One Hundred Thousand 100% post-consumer brightly colored airplanes can be launched from the rooftops of six major downtown rooftops that are 6-11 stories tall. 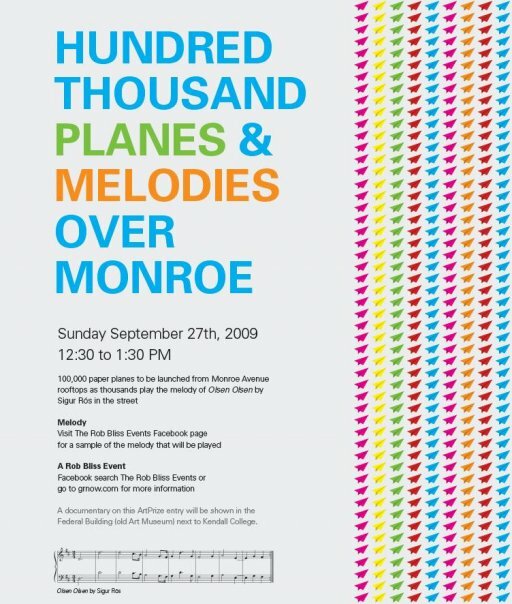 At the same time down below, thousands of musicians of all skill levels, instruments, and ages will come together to play a beautiful melody (A single melody from Sigur Ros’ Olsen Olsen) in the streets as the sky and roads are filled with rainbow colored airplanes. Whether you play it or bang it, hum it or strum it no one is excluded- even if you don’t think you’re any good I want you here singing along with us. Each rooftop will have its own color, with synchronized launches like fireworks. This once in a lifetime event will be an event of brotherhood, a celebration of life and a reminder that we are all in this together. Rob says that he’s worked every day for half a year to create this event and that this event will exceed all expectations and be something that you will be able to remember for the rest of your life if you decide to not be one of the people who sees pictures and video the next day! Here’s some audio from IPR News Radio where Rob talks about some of the technical details.